My currently painted DE suffer a little bit from the impatience and inexperience I had when I first got them with the release of 3rd ed. 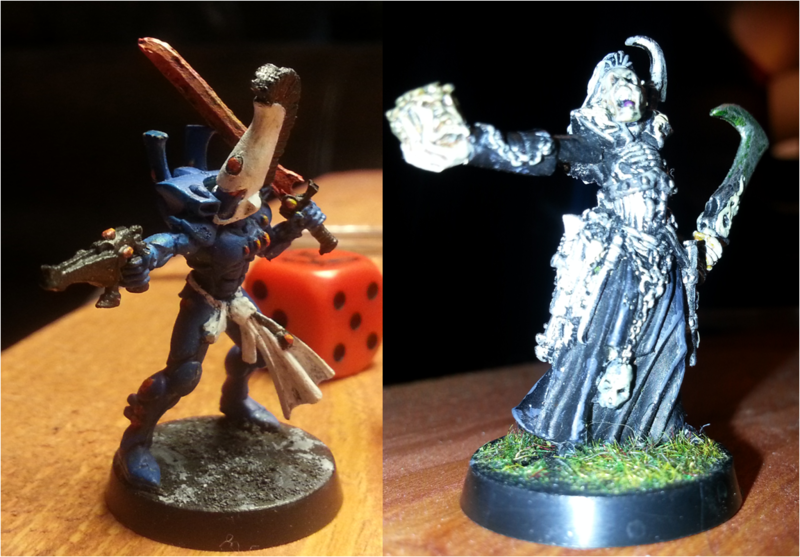 Namely, my 30 warriors span 3 different paint schemes, with the Wyches having a completely different scheme as well, though at least the beastmaster model matches. 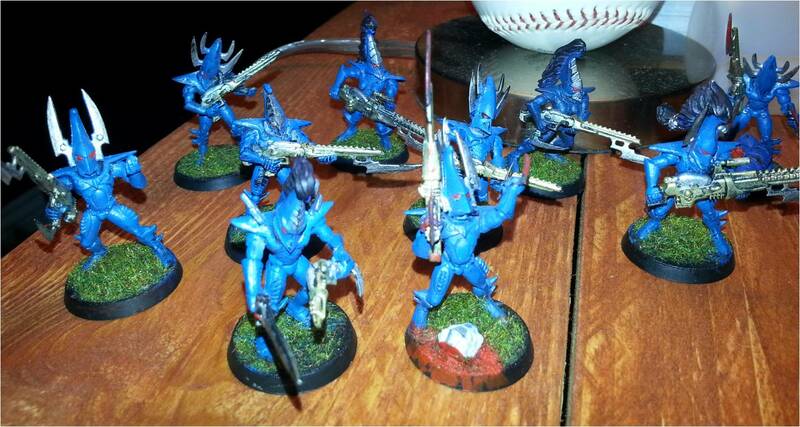 My first batches of warriors featured a metallic blue paint, with silver and gold weapons. As I've mentioned before, our local shop hosts a 1k Tournament the first Sunday of each month. It's been a while since I was last able to go, but it's looking like I'll be there this Sunday. Of course, not getting to play very often, I probably over think what to bring. One benefit of being an admitted army-hoarder is that I have lots of options, not only within a single army. 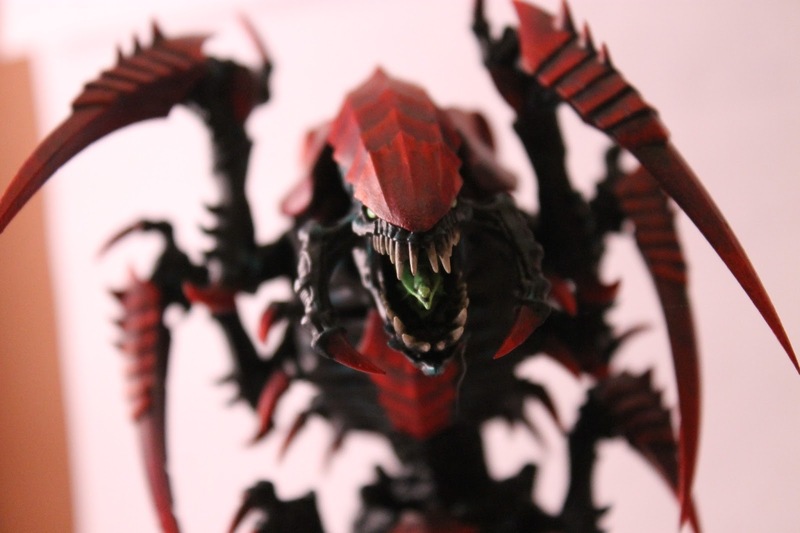 The most likely choices for me are Tyranids (obviously), Orks, or Dark Eldar. Interestingly, I have together the pieces to have allied Eldar for my Dark Eldar (assuming no one takes issue with using the old Codex one day after the new one is released). 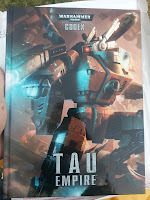 Very unlikely choices would be Tau or Necrons; they would require some feverish assembly, which I would like to avoid if possible, and both are a little out of date. As the title of the post suggests, we're planning another gaming weekend for June 29th. 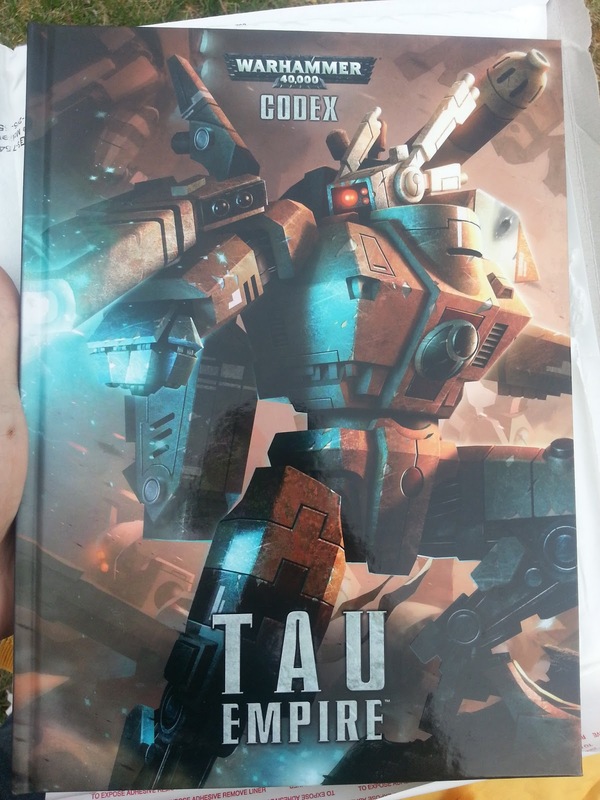 We're still in early discussion and planning, but it's looking like the big game will feature Ron's new Tau, possibly with +Chandler D adding some firepower either from shared Tau or other allies, going up against my Orks, who might need some allies depending on the point size. The main event. The big one. 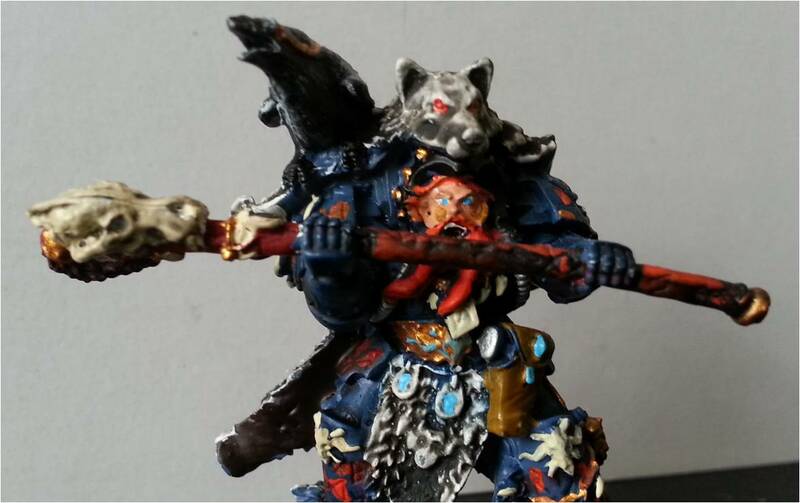 +Chandler D fielded two 2,000 point Space Wolf armies, one of which had Space Marine Allies. His lists faced off against two 2,000 point Tyranid lists commanded by Evan and Ron. We used the full 8'x4' table and just about every single piece of terrain available to us. As I've dived further into the hobby, and seeing numerous impressive examples from other hobbyists and gamers, I decided that I wanted to expand my painting repertoire to include airbrushing. For one, it would present a new challenge and learning experience, and keep me from stagnating in my skills as a painter. 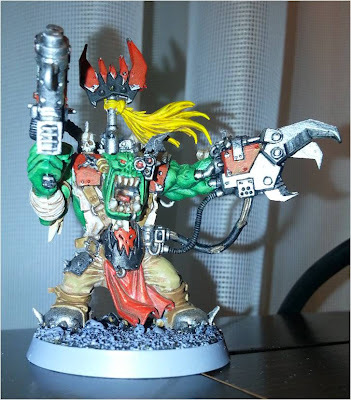 Secondly, the versatility of an airbrush could allow me to eventually perform new effects not possible with a regular paint brush, as well as more efficient assembly-line painting of mass units. As I'm sure anyone who has looked into airbrushing can attest, it can be a little overwhelming. I spent several months doing research on different kinds of airbrushes, companies, techniques, what supplies were needed, and so on. I'm hoping to put my experiences down in a series of posts, including all of my pitfalls, stumbles, mistakes, and learning experiences so that you might be able to avoid some of my missteps. Of course, you'll want to take into consideration that I'm still learning and could get things wrong too. For readers with more experience, please(!) correct me if I'm doing something wrong or giving terrible advice/lessons; that's the last thing I want to do. It has been a while since we've had an update. For that I apologize. I was out of town for business and, when possible, have been writing up the big game bat rep for our gaming weekend, which is taking a lot longer than I'd anticipated. I am expecting to have to split it into two parts, with the first part up soon. To get back into the swing of things and provide a quick little post while I wrap up the maps for Part 1 of the Bat Rep, I'll provide you with an update on a model I managed to complete while out of town: my Ork Warboss from the Assault on Black Reach starter box.